SNES The Legend of the Mystical Ninja (USA) in 24:52.37 by zggzdydp. 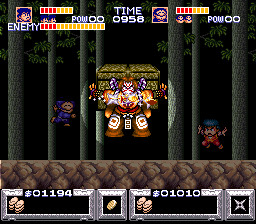 The Legend of the Mystical Ninja is the first Super Nintendo game in the Ganbare Goemon series, based on a noble thief in Japanese folklore. This run improves on the previous run using new tricks and glitches such as the scroll abuse glitch, which saves a large amount of time.